First thing that I noticed was how small this synth really is.. I posted a topic about the JU-06 on Reddit and someone asked how I feel about the small controls. Well, the sliders and buttons are tiny but luckily they feel really solid. 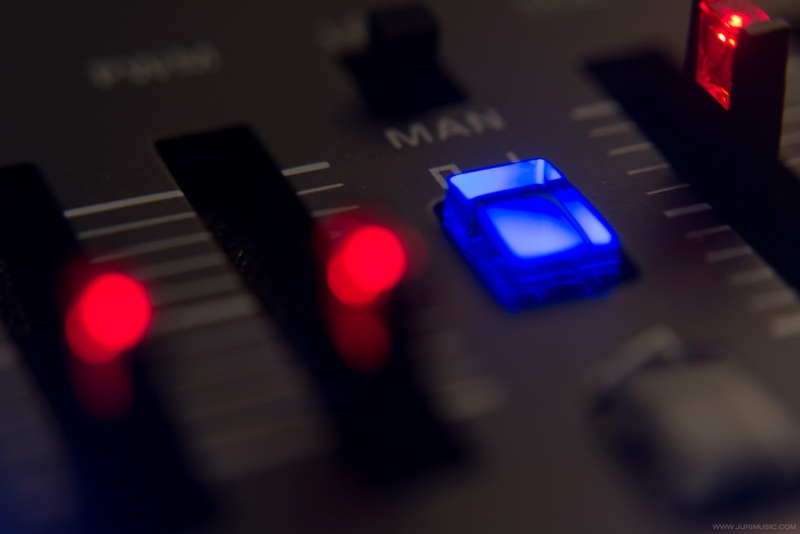 The problem for me is that the range of motion on the sliders is somewhat limited and for example making an accurate filter sweep or setting the filter on the exact position quickly is not that easy. The difference is huge when I compare the JU-06 to my Korg Arp Odyssey. With Arp there's plenty of range on the sliders and I can easily dial in just the setting I was looking for. But hey, you can't carry an Arp Odyssey in your backpack, power it up with batteries and have a smoky jam in the park. I totally understand that consumers are nowadays looking for compact gear. But I feel that on this case the compact size is compromising the playability slightly. I still gotta underline that Roland uses quality parts and the sliders and buttons feel really good. Overall the feeling is solid and very reliable, thumbs up on that! Dear Mr. and Ms. Roland, please don't use 1/8 inch mini jacks on any gear. 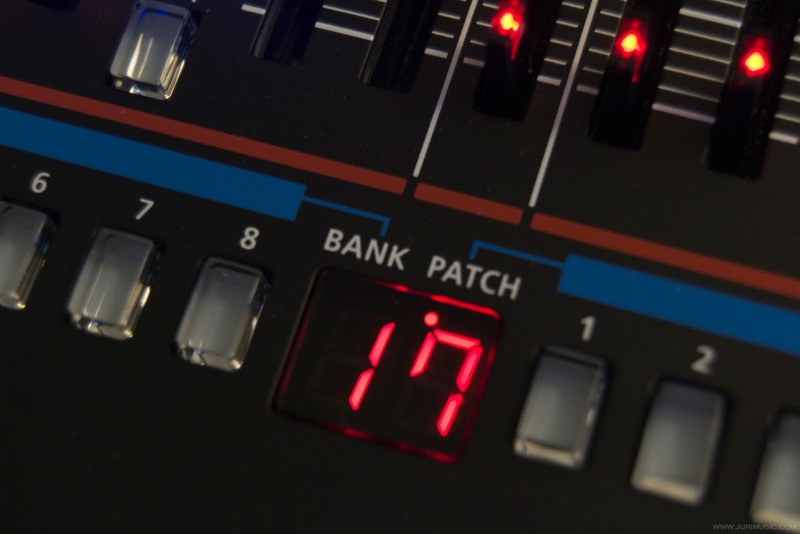 It's a real pain in the arse to connect this synth and this "feature" really makes me a dull boy. I understand that this choice was probably dictated by the compact size of the synth, but next time please just add slightly more room and use regular 1/4 inch jacks. Thank god they used standard midi in/out jacks and there's no need to use adapters. 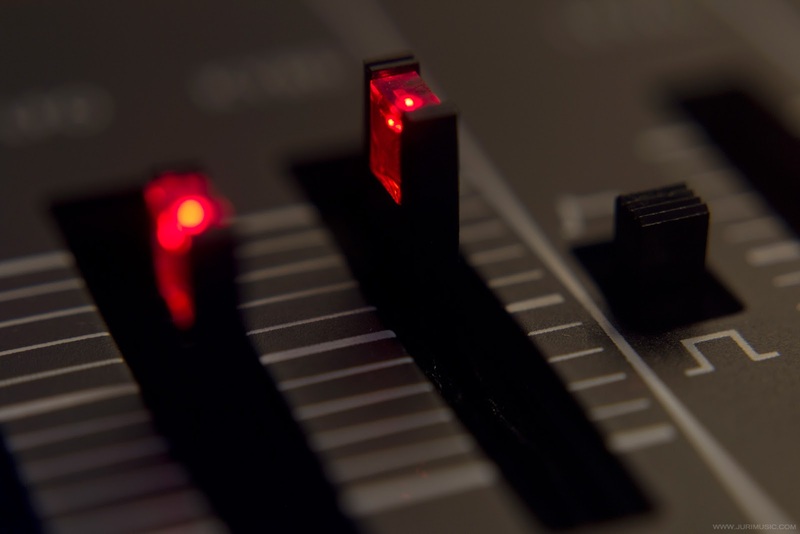 One big part of the Juno sound comes from the famous chorus effect. 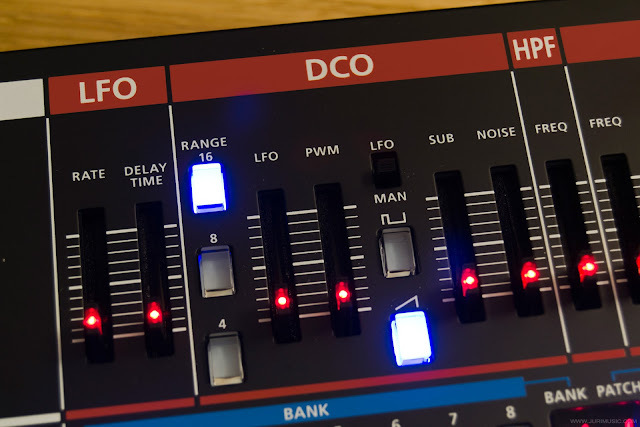 JU-06 has only one DCO (just like original Juno-106) and the chorus is used to "fatten up" the sound. I'm not that experienced with synths and it was a bit of a surprise how different the one oscillator JU-06 sounded compared to my Arp Odyssey with two oscillators. Even though the Arp is just duophonic the second oscillator adds so many possibilities and it can produce some huge sounds when I detuned the second oscillator slightly. JU-06 on the other hand is a more straight forward work horse and the chorus is kinda used to mimic those detuned sounds that one could produce with a two oscillator synth. I feel that Roland captured the analog vibe of the chorus effect perfectly. It sounds really rich, lush and well... analog. 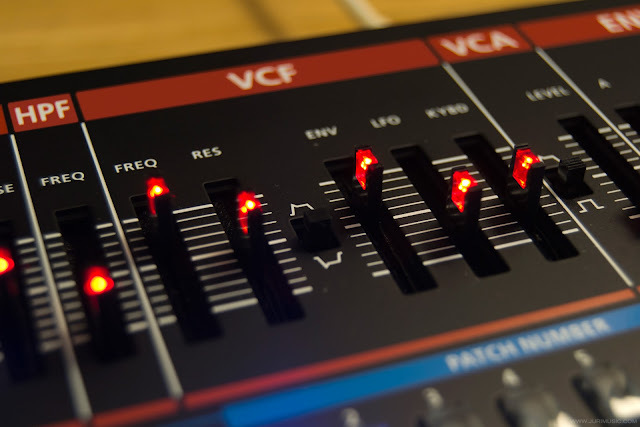 Chorus circuit on the original Juno-106 is noisy and Roland went so far with their reproduction that they even modeled the chorus noise. Obviously they were smart and added the possibility to adjust the chorus noise level: full, half and off. I made some test recordings and noticed that the chorus noise can be a bit of a problem when you start layering more than few synth tracks. So the option to set the chorus noise level to half or even completely off is a really handy feature. Thanks Roland! 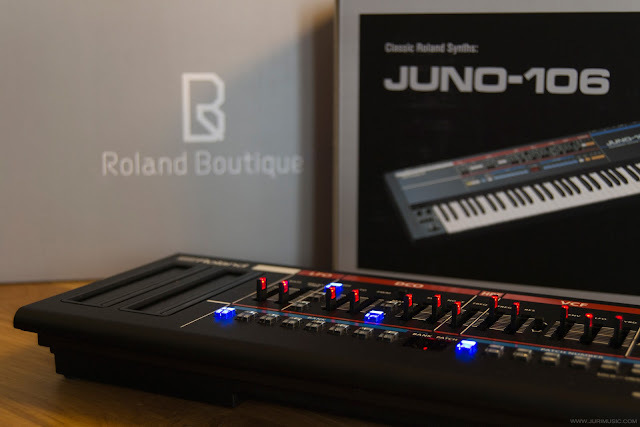 One thing that is worth mentioning is that the JU-06 only has 4 voice polyphony (the original Juno-106 has 6 voice polyphony). You can chain two Boutique units together and get eight voices, but that's another 300€.. Personally I don't think that the four voice limitation is that bad. I'm not a real keyboard player and I like keep it simple. Yes, it sounds very very good. I haven't played an original Juno-106 and I can't really say if the JU-06 sounds 100% like the original. But to be honest, I don't think that is important. 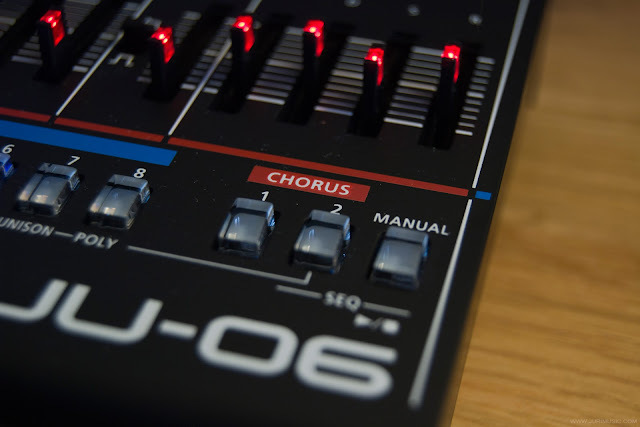 JU-06 is a wonderful sounding synthesizer that manages to capture the character and feel of the original Juno-106. Only thing that really matters is the sound and to my ears this little beast sounds fantastic! Thanks! :) Yeah, the warped pitch sound really good..